Our video glitchesarelikewildanimals! will be showing today at the BAM! Festival in Hengelo, Netherlands. On March 27, 2015, at the annual conference of the Society for Cinema and Media Studies in Montreal, Steven Shaviro, Patricia Pisters, Adrian Ivakhiv, and Mark B. N. Hansen participated in a panel I organized on “Post-Cinema and/as Speculative Media Theory.” It was standing room only, and many people were unable to squeeze into the room (some images are posted here). Thankfully, all of the presenters agreed to have their talks recorded on video and archived online. Finally, you can look forward to hearing more from the panel participants, all of whom are contributing to an open-access collection titled Post-Cinema: Theorizing 21st-Century Film, co-edited by myself and Julia Leyda (forthcoming 2016 from REFRAME Books). More details soon, so stay tuned! 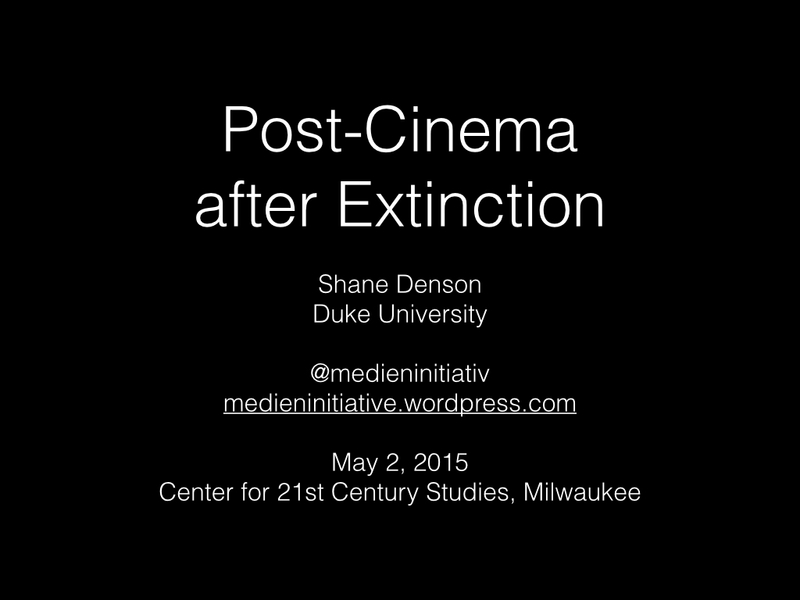 In this talk [from May 2, 2015, at the “After Extinction” conference, Center for 21st Century Studies, Milwaukee], I want to argue that contemporary, digital moving-image media – what some critics have come to see as properly “post-cinematic” media – are related materially, culturally, and conceptually to extinction as their experiential horizon. Materially and technologically, post-cinema emerges as a set of aesthetic responses to the real or imagined extinction of film qua celluloid or to the death of cinema as an institution of shared reception. Significantly, however, such animating visions of technocultural transformation in the wake of a formerly dominant media regime’s demise are linked in complex ways to another experience of extinction: that of the human. That is, post-cinema is involved centrally in the mediation (or premediation) of an experience of the world without us – both thematically, e.g. 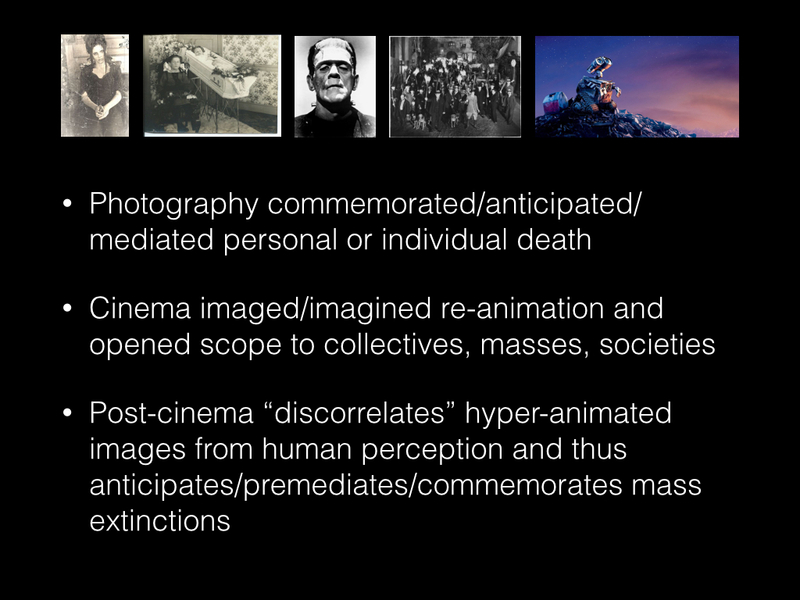 in films about impending or actual extinction events, and formally, in terms of what I call a general “discorrelation” of moving images from the norms of human embodiment that governed classical cinema. Such discorrelation is evidenced in violations of classical continuity principles, for example, but it is anchored more fundamentally in a disruption of the phenomenological relations mediated by the dispositif of spectator, screen, projector, and analogue camera. 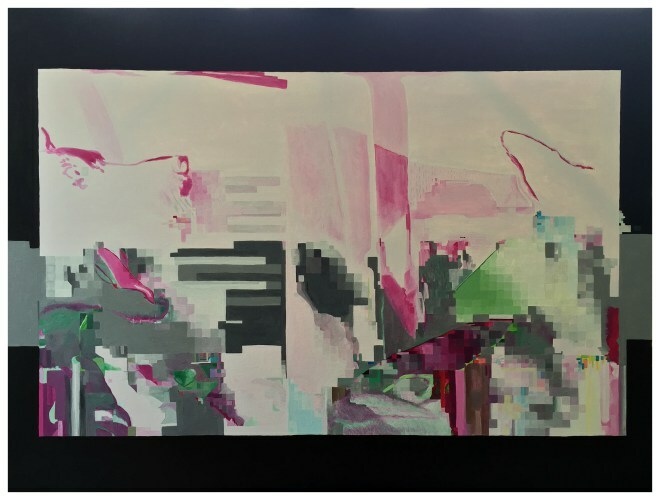 Digital cameras and algorithmic image-processing technologies confront us with images that are no longer calibrated to our embodied senses, and that therefore must partially elude or remain invisible to the human. Anticipating and intimating the eradication of human perception, post-cinema is therefore “after extinction” even before extinction takes place: it envisions and transmits affective clues about a world without us, a world beyond so-called “correlationism,” a world that arises at the other end of the Anthropocene – or perhaps a world that we inhabit already. Let me start with a set of claims that is almost certainly too large and sweeping to be completely right but which, nevertheless, may not be completely incorrect in terms of the general trajectory it frames. Photography, to begin with, commemorated/anticipated/mediated personal and/or individual deaths; next, cinema imagined/imaged a form of re-animation from photography’s death-borne traces and opened its scope to include collectives, masses, societies; post-cinema, finally, “discorrelates” the hyper-animated image from human perception and in this way anticipates/pre-mediates/commemorates mass extinctions. In effect, two trajectories – one temporal and one quasi-spatial – coincide in this movement from the photographic to the cinematic to the post-cinematic: temporally, there is a reduction of the technical time-scale, from the long exposure of the Daguerreotype to the snapshot that enabled cinematic recording, which at some point required standardization but eventually gave way to the microtemporal duration and future-orientiation of high-speed data and algorithmic processing; spatially, on the other hand, there is an increase in the scope or focal expanse of mediation, from the individual to the group to the species to the planet. The task that I’m undertaking here can be seen as that of correlating these two trajectories in order to understand why post-cinema, with its microtechnical and micro- or sub-perceptual basis, tends to take a macrolevel interest in issues of a planetary scale (including, centrally, global ecological disaster and extinction). At stake, then, is a correlation of material and thematic aspects of post-cinema’s anticipation, premediation, or commemoration of extinction. And this media-technical and narrative-thematic correlation is paradoxically motivated, as I’ve suggested, by the “discorrelation” of post-cinematic images from human perception. To get a first idea of what it might mean for an image to be “discorrelated” from humanly embodied perception, consider the famous (photographic) views of the Earth from space (e.g. 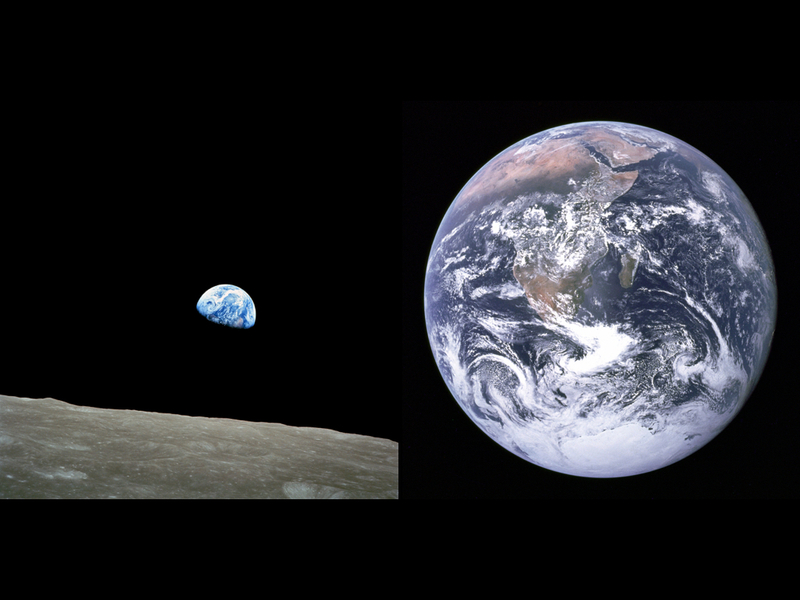 NASA’s Earthrise, from 1968, or Blue Marble, from 1972). According to Martin Heidegger, who lived just long enough to see these images realized as ontically concrete objects rather than merely metaphysically implicit possibilities of the “age of the world picture,” such images depict a planet effectively devoid of life – sterile, machinic images of a planet reduced to a merely present-at-hand thing, or the “stuff” of an abstract “Nature.” And while this observation may not be fully satisfactory, perhaps it can help us to understand the way that post-cinema disrupts the human or humanistic focus of classical cinema. 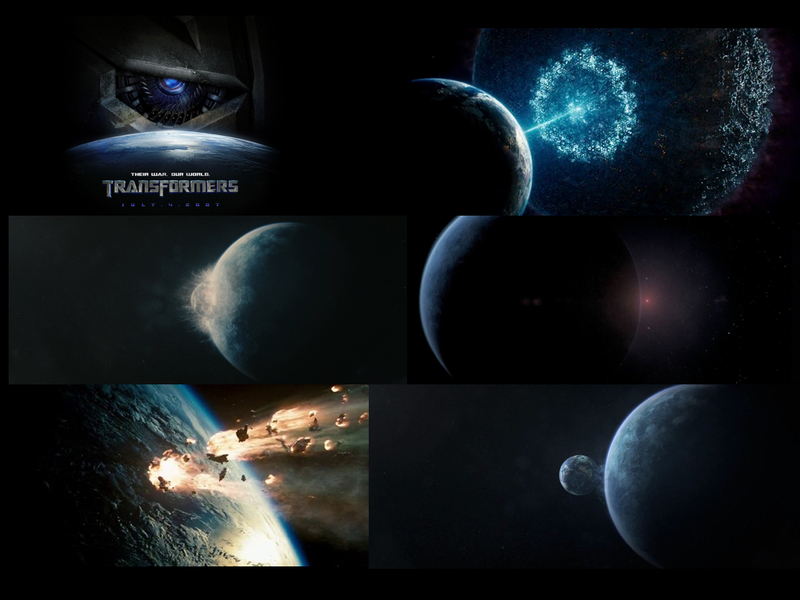 Planetary images feature prominently in a variety of properly post-cinematic productions – from Michael Bay’s Transformers franchise to Lars von Trier’s Melancholia. In both of these examples, which are wildly different from one another in terms of pacing and affective tone, human or planetary extinction is centrally at stake, and the view of the Earth from without serves to emphasize these stakes. But the crucial operation that marks the shift to a post-cinematic regime happens at a much more basic level of visual mediation; that is, the planetary images may gesture towards a dehumanization of vision, a displacement of embodied perception by means of a macro-scale perspective, but the real shift away from the ready-to-hand-ness of worldly involvement that Heidegger worried about is consummated at a much smaller scale, by means of images that fail to direct our perspective in the way that cinema classically did. 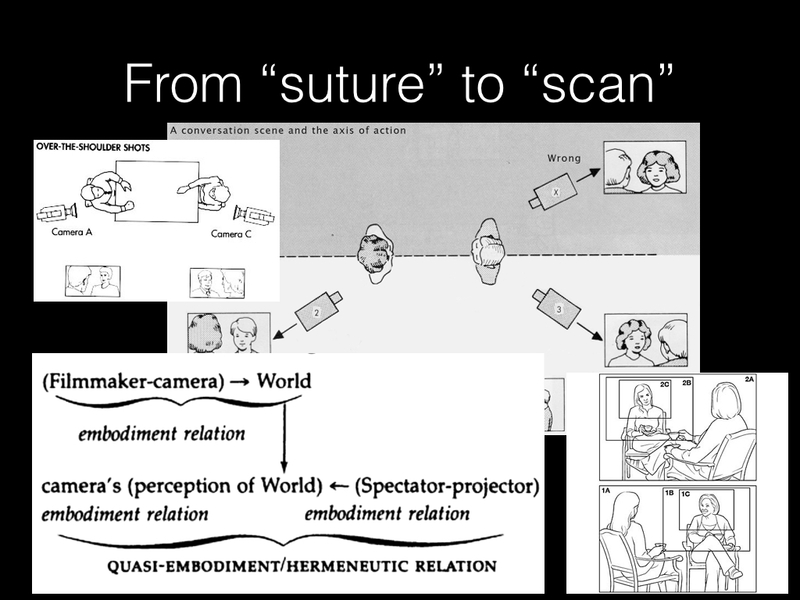 One way of thinking about the de-linking of the camera from the focused view of the human is by way of a shift from “suture” to “scan”: classical cinematography and editing techniques directed our attention, literally showed us where to look, but post-cinematic images often require us to view them differently, to attend to the full frame and all of the elements it contains as potentially equal in significance (or insignificance). 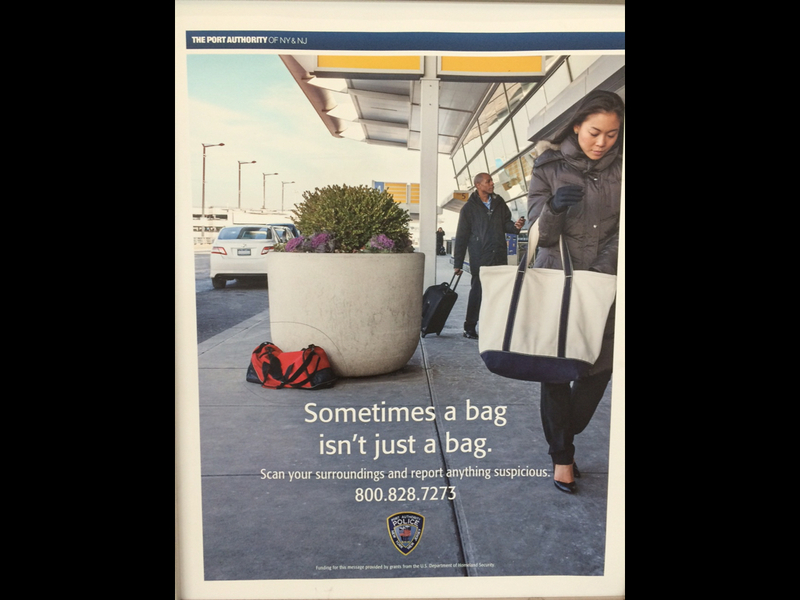 Such images elicit not so much the investment of a gaze but a more fleeting, dispersed, and scanning form of regard. Vivian Sobchack’s classic work on the phenomenology of film experience revealed a strong, material-semiotic correlation between human faculties of perception and locomotion, on the one hand, and cinematic techniques for framing time, space, and action in narrative settings. Of course, these correlative bonds could be and were challenged by avant-garde and other filmic practices, hence revealing the bodily and perceptual norms at the heart of classical cinema to be contingent and constructed rather than “natural.” But today the correlation is subject to a more fundamental sort of challenge, as theorists of the post-cinematic have argued (and as Sobchack herself anticipated in her distrust of electronic mediation). Steven Shaviro’s description of a move from continuity principles to an essentially post-continuity regime helps us to understand this transformation. Again, one place we witness the challenge to continuity, and hence the de-emphasis of bodily location and locomotion as central vectors for orienting the spectator’s intentional relations to post-cinematic images, is in the camera’s framing of scattered, unfocused, and merely scannable images. For example, the Paranormal Activity series utilizes a variety of cameras severed from human vision or interest, including the nonhuman vision of surveillance cameras that “reflect” the general dispersal and diffusion of the visual in the so-called control society. These images intimate to us the way that ubiquitous computing and the complete biopolitical modulation of life and labor might be prepared by way of the ubiquitous vision of drones, smartphones, satellites, and stoplight cameras. And this environmental sort of vision displaces the centered vision of the human subject, which is now expected to “see” in the manner of such machines. We regard post-cinema’s images much like we regard images of the planet – not as something that frames an actionable scenario but as a present-at-hand image-object that can be scanned for information – which might or might not present itself to us. In the meantime, of course, images of Earth have themselves shifted from photographic to digital imagery and data-driven animations; thus, scientific and entertainment-oriented images of the planet, both of which are reliant on the same frameworks and infrastructures for their computer-generated imagery, are today tightly imbricated in a post-cinematic media regime. 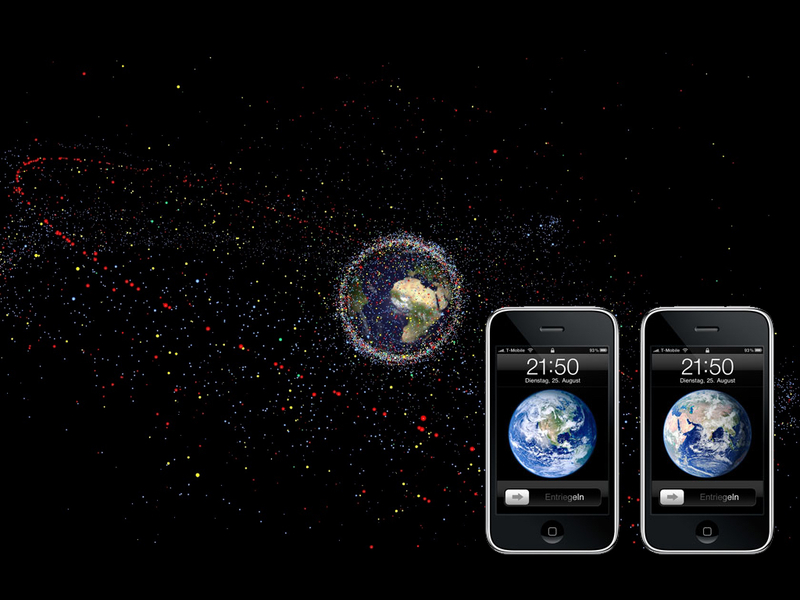 In a recent talk at Duke University, Max Symuleski has considered the ways that images such as the ESA’s rendering of the great mass of space junk orbiting the planet challenge cognitivist and anthropocentric perspectives by indicating a non-human form of movement, paradoxically restoring the human artifactuality that Heidegger noted was missing in earlier pictures of the Earth and linking non-anthropocentric movement with our own activity by way of smartphones, GPS, etc. — devices that are in contact with this orbiting mess in ways that bypass our cognitive grasp on the world. This radically environmental perspective has been articulated recently in Mark Hansen’s perspective on the “feedforward” operation of 21st century media and the essentially non-psychic experiences that we have with and through our devices’ sensors. According to Hansen, these sensors register data about the world at a microtemporal scale that is categorically beyond the pale of human perception, but they can feed this data forward to us, thus putting us in touch with aspects of the world without us – offering us an experience of events that are effectively discorrelated from human cognition. And it is precisely this sort of experience, I suggest, that links contemporary planetary imagery – and post-cinema’s preoccupation with global-scale events such as extinction – with micro-scale transformations in the relation between image and perceiver. In a talk titled “Post-Cinematic Wastelands and the Anthropocene Imaginary,” delivered last month at the Society for Cinema and Media Studies conference in Montreal, Selmin Kara opens up a space for thinking about these relations. 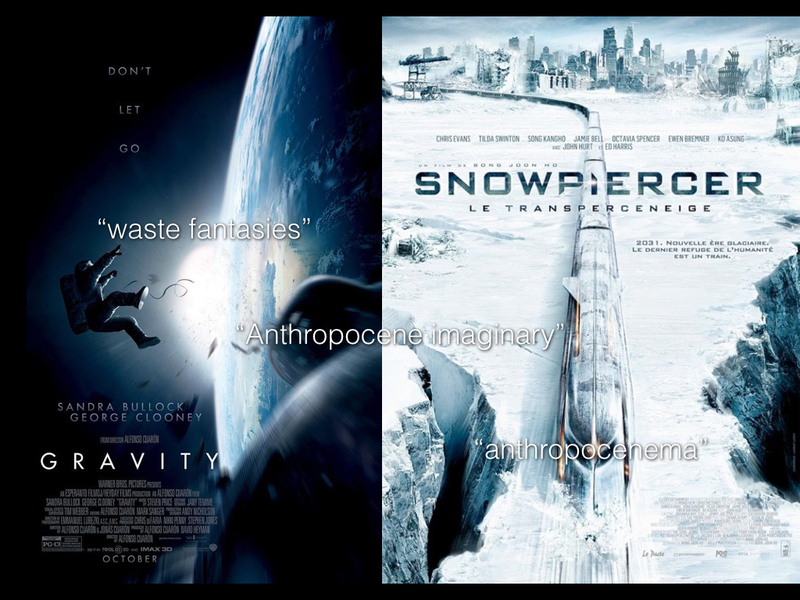 According to Kara, Alfonso Cuarón’s 2013 Gravity positions space-debris as a new sort of villain for the 21st century; significantly, Kara relates this, along with images and figurations of global catastrophe in films such as Snowpiercer, to what she calls “waste fantasies.” Waste, according to Kara, is imaged as an event, one that articulates new forms of time and space in accordance with the conditions and the geological scale of the Anthropocene. Accordingly, she sees a range of post-cinematic films, including the apocalyptic or cosmic scenarios of Melancholia, Tree of Life, or Beasts of the Southern Wild, as (in her words) “pointing to an Anthropocene imaginary.” Building upon this perspective on what Kara calls “anthropocenema,” I am trying to specify the relation that obtains here between the imaginary and the real – i.e. between thematic-representational figurations and the material-medial realities of post-cinema (and the larger environment in which it participates). Ultimately, I am trying to link post-cinematic productions generally, including those that lack an explicitly global-ecological or anthropocenematic focus, with a sensibility (if not an imaginary) that is attuned to the possibility (or reality) of extinction. Again, the crux upon which my argument hinges is the link between macro-scale perspectives and a micro-scale transformation in the relation between image and perceiver. 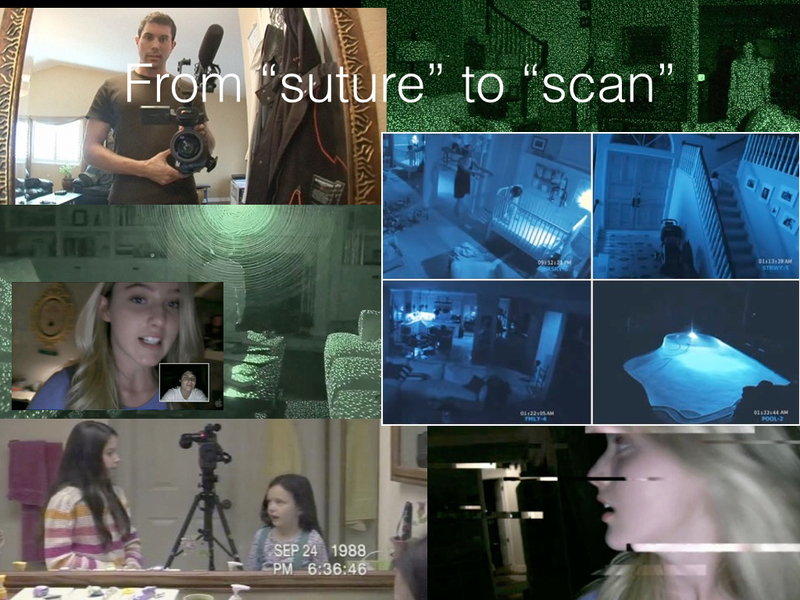 I have pointed to Paranormal Activity’s scannable surveillance images, where nothing apparently happens for long stretches, as one site where a discorrelation from classical cinema’s human-centered “action images” (in Deleuze’s term) takes place. Another such site is in the “hyperinformatic” images of recent action cinema itself, which so often disregards the rules of continuity editing (such as the 180-degree rule) in its staging of frenetic action scenes and high-speed chases. Michael Bay’s Transformers films (the most recent of which is fittingly subtitled The Age of Extinction) are full of such violations of continuity, but more significant, I would argue, are the microperceptual affronts to subjective focus or “molar” perception exhibited in the films’ central visual spectacles: the CGI-heavy images of the Transformers transforming embody a certain outstripping of human perceptual faculties, discorrelations that are staged in continuous takes, without the need for explicit violations of continuity. 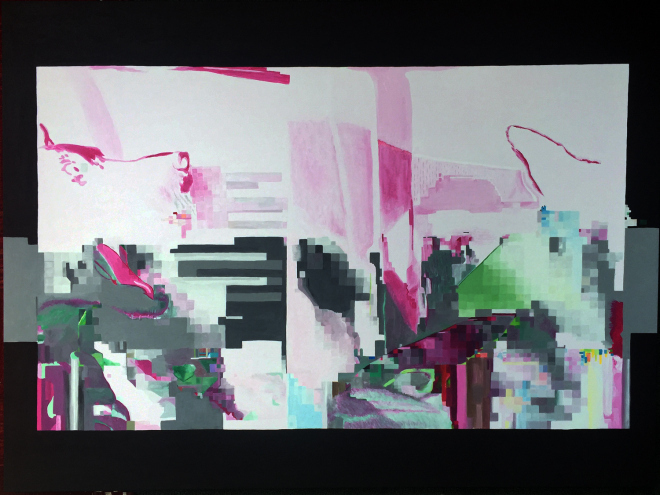 The images are “hyperinformatic” in the sense that they overload our capacities, giving us too much visual information, presented too fast for us to take in and process cognitively – information that is itself generated and embodied in informatic technologies operating at speeds well beyond our subjective grasp. In an important sense, then, these images embody an ostentatious display of the inhuman speed of post-cinema’s technical infrastructure, hence producing images that are literally indifferent to us, that do not depend upon our investment of perceptual attention, that positively resist perceptual capture. (Less ostentatiously, Birdman’s digitally based, fake continuous take plays at concealing the divergence between human vision and the humanly impossible embodiment of digitally composited space upon which it depends so crucially.) These are both glimpses, in other words, of a world without us – concise, non-representational images of the worldly discorrelation upon which post-cinema generally is founded and upon which it articulates its representations of global scale disaster and extinction in particular. Thus, post-cinema’s post-extinction ecologies and planetary images dispose us to think about “the world without us,” or, in cases like Interstellar, they shift the focus and imagine the converse scenario of “us without the world.” But these scenarios also do something more. Interstellar ostensibly follows a long tradition of outer-space odyssey sci-fi movies, but the film’s central visual attraction – the wormhole tesseract at the end of the universe that links spatiotemporally distant times and spaces – actually focuses more specifically on digital techniques of visualization that bypass the cinematic techniques and forms of vision that the film’s forebears utilized; it attempts, in this way, to recode spectatorial engagement as a diffuse or prismatic, rather than centrally focused, punctual, or perspectival, relation. 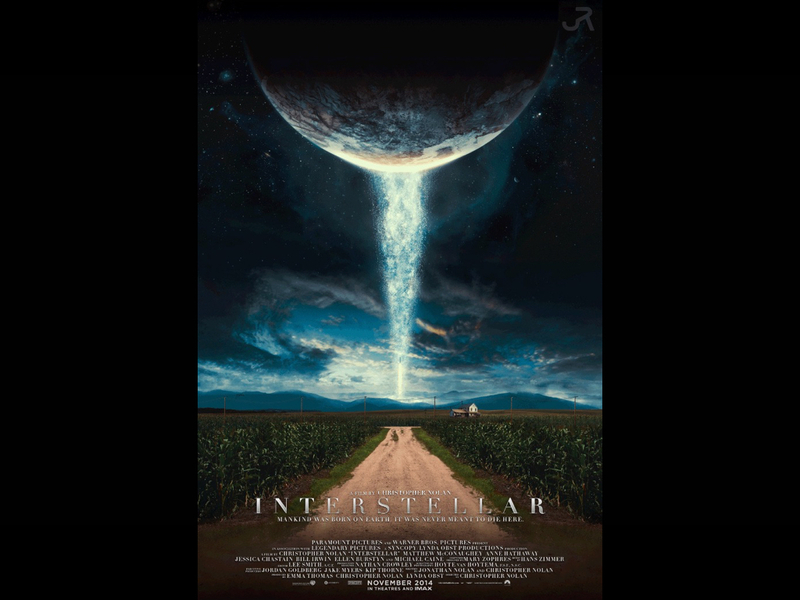 Staged in accordance with the material parameters of the hyperinformatic medium in which it is realized, Interstellar’s tesseract might be seen as an emblem for post-cinema’s manner of linking micro- with macro-cosmic dimensions – i.e. the sub- with the supra-perceptual, or the micromateriality of the medium with the environmental materiality of a planet seemingly doomed to becoming incapable of sustaining life. Finally, then, post-cinema is (quite “naturally”) “after extinction” because it emerges along with and as a part of the massively environmental agencies of 21st century media, with their real-time accumulation, microtemporal processing, and feedforward operationalization of data. Post-cinema emerges in the light of knowledge of – and more importantly, in the light of detailed algorithmic models of – impending planetary demise; and these models are the product of precisely those data-intensive operational characteristics of 21st century media, from which post-cinema is inseparable. Climate change is linked not only thematically to post-cinema (in various examples) but materially informs it through the shared medial basis upon which each of them is mediated to our experience – and through the shared medial basis by which direct sensory experience is not and cannot be made available to consciousness. The eclipse of conscious agency not only puts us in a mood to contemplate extinction; in a very real sense, our inchoate grasp of this eclipse is an affective grasp or inkling of the techno-environmental agencies that have produced (an awareness of) extinction as a very literal potential (hence an inkling of the operation of media-technical agencies that continue, at present, to expedite the eventual occurrence of this potential future). Post-cinema encompasses moving-image (and other) media generated in and through a media environment that itself situates itself after the urgency of the extinction that we now anticipate. Being after what lies ahead, post-cinema embodies the temporal logic of the feedforward, a temporality of pre-post-presence or a present past that is also past the future. 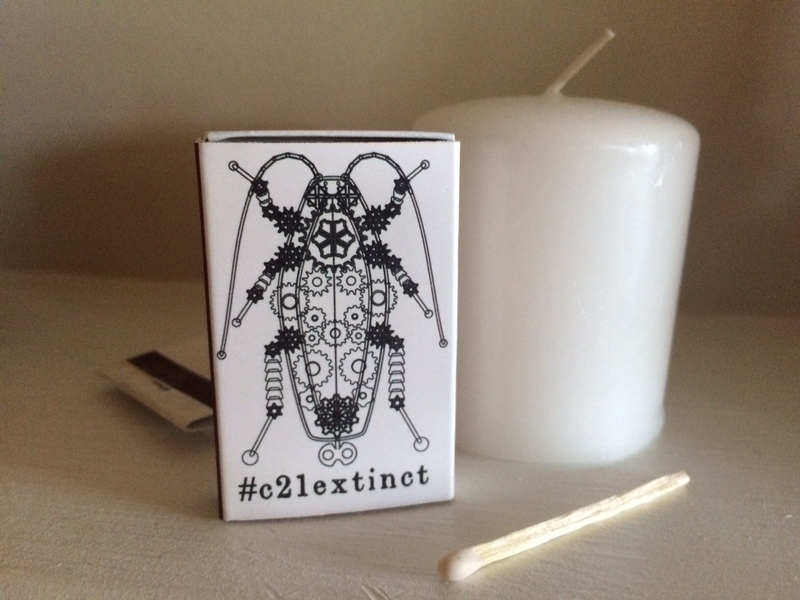 A few weeks ago (April 30 – May 2, 2015), I had the pleasure of attending one of the most engaging conferences I have been to in recent memory: “After Extinction,” hosted by Richard Grusin and the Center for 21st Century Studies at the University of Wisconsin-Milwaukee. 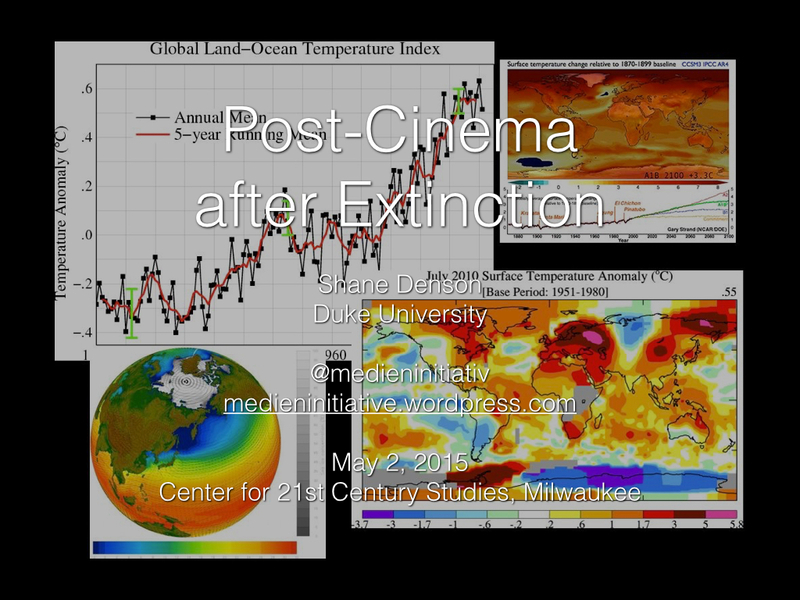 I’ll be posting my talk, “Post-Cinema After Extinction,” when I get a chance (so stay tuned…), but in the meantime I wanted to pull together all of the plenary talks (which, thankfully, were archived on video). As you’ll see in these talks by William Connolly, Joanna Zylinska, Daryl Baldwin, Joseph Masco, and Cary Wolfe, the conference brought together a diverse range of voices and perspectives and created space for an interesting and wide-ranging conversation about the conditions of life at our precarious moment. Today I finished one of two paintings that will be part of a multimedia installation that I’m working on with Shane Denson. 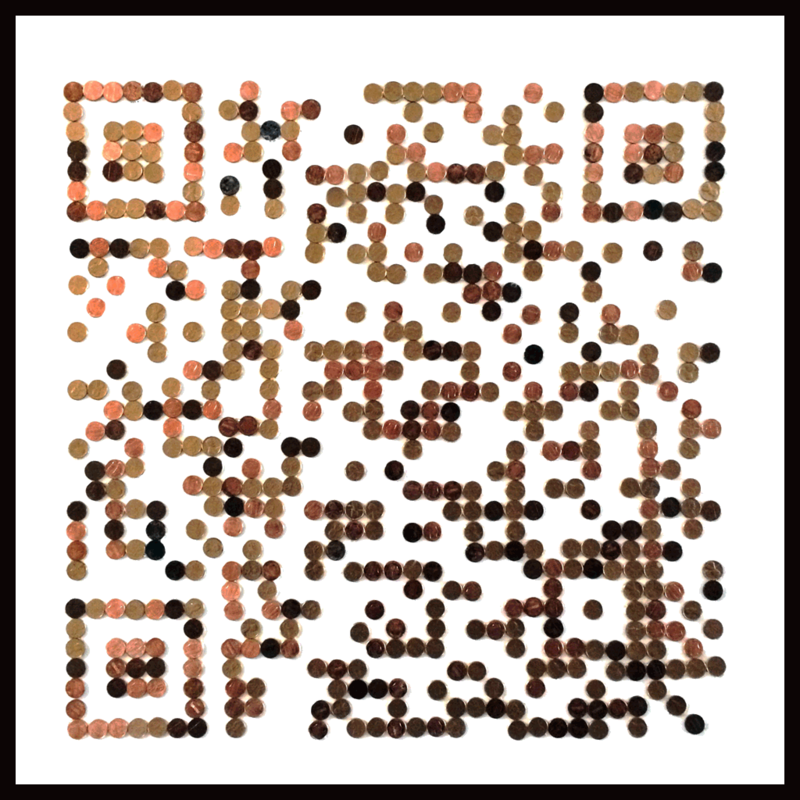 The pennies arranged here form a functional QR code. The composition reflects on the dissolution of the gold standard and the transition to the fictitious capital of data-driven finance. 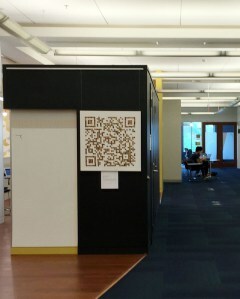 It’s on display now through August at The Edge, Bostock Library, Duke University. Above, Mark B. N. Hansen’s talk “Speculative Protention, or, Are 21st Century Media Agents of Futurity” — the last of five videos documenting the “Post-Cinema and/as Speculative Media Theory” panel I chaired on March 27, 2015 at the Society for Cinema and Media Studies annual conference in Montreal. See here for more information and a general introduction to the panel.